Citrus fruits rank third in area and production after banana and mango in India. 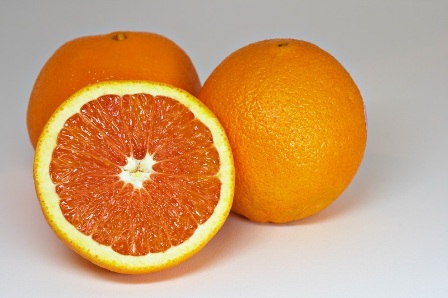 Sweet oranges are the second largest citrus fruits cultivated in the country. Andhra Pradesh, Maharashtra, Karnataka, Punjab, Haryana and Rajasthan are main sweet orange growing, stages. Maximum area under sweet oranges is in Andhra Pradesh, followed by Maharashtra and Karnataka. Well marked belts of sweet orange cultivation in the country are Abohar, Fazilka, Ferozepur, Faridkot and Hoshiarpur, in Punjab; Hisar in Haryana; Ganganager district in Rajasthan; Marathwada region of central Maharashtra, Ahmednagar, Pune and Nasik of western Maharashtra and Anantapur, Kodur, Cuddaph Nelgoda, Chittoor districts of Andhra Pradesh. The production of sweet orange is largely favoured by dry, semi-arid to subtropical conditions. However, plants grow well under subtropical climate and can even withstand occasional light frosts. However, good results are not sure under cooler climates. Several hours of exposure to a temperature of -3 C causes severs injury to plants. On the other hand, very high temperatures are also detrimental. The average temperature for growth is about 16 C-20 C. Hence, it can tolerate well maximum temperature of 32C-40 C and minimum of 17C-27 C as it exists in most of the sweet orange growing belts of the country. Being evergreen, citrus requires good amount of water and at least well-distributed annual rainfall 500-775 mm is necessary. When rainfall is unevenly distributed annual over the year, additional irrigation is often necessary. Under warmer conditions, the colour development is poor; however, excellent deep orange colour of the skin develops when grown under subtropical conditions. Quality is very good under dry semi-arid conditions, while under humid conditions fruits insipid. Sweet orange can be grown on a wide range of soils. These grow in almost any soil if it sufficiently aerated and deep, allowing the roots to penetrate to desired depth. In India, sweet orange is being cultivated on a wide range of soils, e.g. alluvial, sandy loam to loam, red sand soils to black clayey soils. In Andhra Pradesh, it is grown on red soil with loamy sub-soils, red sandy sols and black clayey soils. The sweet orange growing areas of Maharashtra have black soils. Thus, a well drained sandy loam to clay loam is preferred by sweet orange. Many varieties of sweet orange have been introduced into India but only a few are prolific ones having good quality. Currently, exotic varieties like Jaffa, Hamlin and Pineapple are performing well in Punjab, Haryana and Rajasthan. Jaffa is a famous, mid-season sweet orange, while Hamlin is an early-season variety. Pineapple is another mid-season variety. Another late-season variety, Valencia, has also shown good adaptability. However, main varieties of sweet orange in India being cultivated on commercial scale are Blood Red, Mosambi and Satgudi. Blood red is the most important variety in Haryana. Punjab and Rajasthan; Mosambi is most popular in Maharashtra whereas Satgudi is extensively grown in Andhra Pradesh. The optimum performance of a variety depends on the proper selection of rootstock for a given set of growing condition. Rootstocks are known to influence the over all performance of a scion including quality. They are also helpful in countering particular scion varieties, to various a biotic and biotic stresses including adaptability t various types of soils, hence, the selection of a rootstock for the adaptability to various agro climatic conditions and suitability for a particular scion is a must. In Punjab, Jatti Khatti and Karna Khatta for Blood red and other sweet orange varieties are the most commonly used rootstocks. For Mosambi scion, Rangpur lime is the best rootstocks in Maharashtra. In Andhra Pradesh, commercially used rootstock, Rough lemon for Satgudi scion is being replaced now by Rangpur lime, which is highly tolerant to drought and also has high productivity and comparable fruits quality. Budding, i.e. 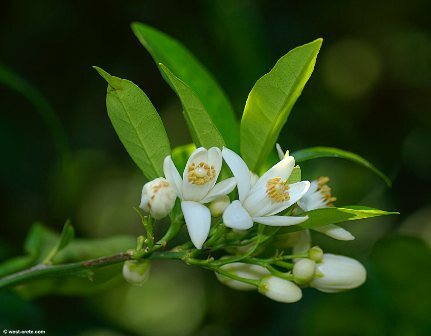 with ‘T’ budding and Patch budding or Shield budding are most commonly used propagation method for sweet oranges. When the rootstock plants of the selected rootstock are one-year-old or come to a buddable stage, the bud of a desired scion variety is budded at a height of about 25-30 cm from the ground level. To ensure good budding success, the budding is done during the January-March or September-October of active growth or when there is good sap flow in the plants. Thus, budded plant should be immediately irrigated. Bud wood of the scion must be taken from virus-free plants so that healthy and productive, true-to-the-type plants are produced. Planting is generally done during monsoon in north-western and western parts of the country, i.e. Punjab, Haryana, Rajasthan and Maharashtra, while in southern India; it is done at the onset of rainy season. Land should be ploughed in a cross manner to soften the upper surface. The pits of 60 cm x 60 cm x 60 cm size should be dug. They are filled with 15-20 kg farmyard manure in south and north India, while in western Maharashtra, the pits should be filled up first with clay soil, murram, soil + farmyard manure mixture apart from 10% BHC powder and micronutrients @ 25g each of Zn, Fe, Mn and Cu if initial fertility level is low. A planting distance of 6m from plant-to-plant and 6m from row-to-row is generally followed in square system of planting. However, planting distance as well as planting density depends upon the cultivar, rootstock used and agro climatic conditions. In general, a density of 250-300 plants/ha in Punjab and Haryana is ideal for sweet orange cultivars budded on Jatti Khatti rootstock. The optimum planting density for Satgudi seeding oranges is 170-200 plants/ha when budded on Satgudi stock itself. In Maharashtra, plants of Mosambi variety budded on Rangpur lime are planted at a distance of 6m x 6m, accommodating 270 plants/ha. Pruning of bearing trees though differs with variety. It consists of removal of dead, diseased, criss-cross and weak branches. Removal of water sprouts and suckers from each rootstock below the bud union is also essential and should be attended to regularly along with thinning of the shoots for better penetration of sunlight and aeration. The cut ends after pruning should be treated with Bordeaux paste to avoid fungal infection. The best time for pruning in bearing trees is after harvesting during late winter or early spring. After each pruning, spraying of Bavistin (1m/litre of water) is beneficial to avoid any secondary infection. Fertilizer requirement of the plants is influenced by various factors like age of the plants, rootstock used, soil and climate along with the crop load in bearing tress. 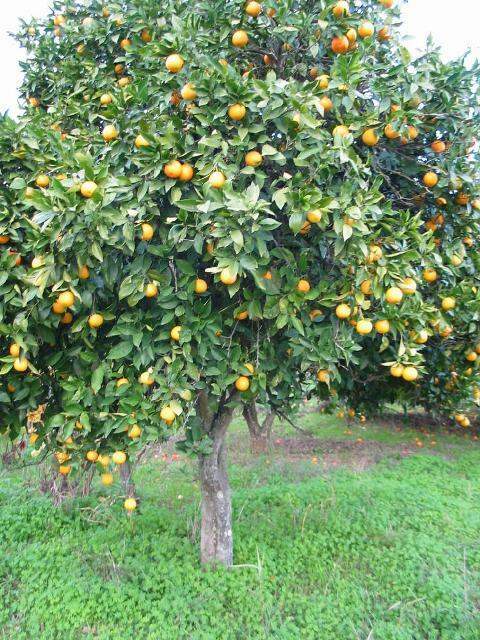 No uniform fertilizer recommendation can be made for all sweet orange cultivars in different agro climatic regions. The fertilizer schedule commonly adopted in different parts of the country is given in Table 1 and 2. Table1. Fertilizer schedule (kg/tree) for major sweet orange growing belts of the country for pre-and early-bearing years. The fertilizers should be applied in a ring from below the canopy of the trees depending on age. For a mature tree, fertilizers is applied in a 30-40 cm wide ring made at a radial distance of 100-200 cm from the trunk as maximum feeder roots are located below the tree canopy. Thought the requirement of major elements is buy and large met by supplementing N,P,K fertilizers, farmers usually forget to apply micronutrients, the most essential part of citrus nutrition. The deficiency symptoms of Mn, Fe, and Zn resemble very closely, making it difficult to judge which nutrient is really deficient. It is also well-known that the deficiency of zinc along with N and to some extent P is a major nutritional problem of sweet orange in North India, western Maharashtra and south India. Deficiency of Fe and Mn is also observed in some areas. Hence a micronutrients mixture should be given when the leaves have fully expanded after a new flush growth. A combined spray of different micronutrients is given in Table 3. Most of the sweet orange cultivars are planted 6-8 m part, leaving much area unutilized. The interspaces can profitably be utilized for growing some short duration crops. The additional crop not only provides additional income to the orchardists, but also helps to check weed growth, conserve soil moisture and p0revents soil erosion. During the initial years of the orchard development, vegetables, soybe4an and cotton crops are successfully cultivated as intercrops. Peas, turnips and cabbage Rabi crop and bottle gourd, bitter gourd and okra in kharif as intercrops are grown. In order to eliminate competition for nutrition by weeds in sweet orange orchard, control of weed is very essential. Apart from Interculture operations, that check weed growth chemical weed control is also necessary during certain period of the year to avoid disturbances to feeding roots. Both pre-emergent and post emergent sprays for weed control are necessary. Application of Diuron as a pre-emergence weedicides spray @ 3kg/ha twice at 120 days interval is quite effective to control weeds up to 280 days. For post-emergent control, use of 2,4-D (Fornoxone) @ 5 kg/ha in 500 litres of water followed by a composite spray of 2.5 litres of Paraquat (Gromaxone) plus 1.25 kg 2,4-D (Fornoxone) in 500 litres of water/ha 10-20 after the first spray is quite effective in controlling weeds. The composite spray of Paraquat and 2, 4-D may be repeated twice at 30 days interval, if needed. It controls/reduces the weed growth for about 4­ month. The frequency of irrigation is influences by soil, climate, variety and age of plants. In northern India and western Maharashtra, water is applied at every 6-8 days interval from March to June and at every 10-12 days interval during November-February. Sweet orange being susceptible to water in the orchard and around the tree trunk should be avoided. In young plants up to the age of 8 years, the irrigation should be given through basis system of irrigation. In grown-up and old orchards, flood system of irrigation may be adopted avoiding water content with tree trunks. In western Maharashtra, drip irrigation system is gaining popularity; ring system of irrigation is adopted for this. Double ring system or bed irrigation is best in reducing the water contact with the tree trunk, thus avoiding fungal infection. A grown-up sweet orange tree needs about 25-20 irrigation in a year, amounting about 1,325 mm of water. Its plants have highest demand of water during fruit development. It is advisable to irrigate the orchard after the fruits have attained pea size. Sweet oranges mature in 9-12 months. Being a non-climacteric fruit, there is no improvement in colour, taste and flavour after harvesting. Therefore, fruits should be harvested when they are fully ripe and attain proper size, attractive colour and acceptable sugar: acid ratio. Sweet oranges can be allowed to remain on their trees on reaching maturity for several weeks without deterioration, except in area and varieties where the incidence of fruit-sucking moth (south India) and granulation (north India) are problems. In such areas, an early picking is advised. Main harvesting season in north India is from December to February, while in south India it is October-March. In Andhra Pradesh, Satgudi oranges are harvested during November-March. In central and western India, November-January for ambe bahar and March and March-May for mrig bahar are time for harvesting. Fruits should preferably be harvested by clipping with secateurs. Sweet oranges are tight-skinned fruits possessing comparatively better shelf life than loose-skinned mandarins. Ripening is a terminal period of maturation, when fruits develop complete blend of flavour, texture and aroma contributing to optimum eating quality. The period of ripening and TSS: acid ratio at which sweet oranges should be harvested is given in Table4. Dipping fruits or spraying fruits with 5% fungicidal emulsion and then dipping them in 500 ppm Ben late or 0.1% Carbendazin (Bavistin) solution helps reduce spoilage and keep them in good condition at room temperature for 20 days after harvesting.